The quiet former fishermen’s district of Kalamaja is today one of Tallinn’s last remaining areas with a hodgepodge of old wooden houses and old-fashioned industrial complexes. The neighbourhood has recently seen a trendy revival, similar to what happened in the Soho districts of New York and London, even though on a smaller scale. Kalamaja has developed a bohemian atmosphere and become a popular residential area and meeting place for the hipsters, trendsetters, artists and young creative people of Tallinn, the capital of Estonia. Today Kalamaja houses trendy boutiques, flea markets, plenty of excellent restaurants, eateries, pubs and the newest coffee shops in town frequented mostly by locals. The surroundings are still a bit rundown, with plenty of abandoned houses and factories; however, the district is on the rise more than ever and as a consequence real estate prices have become tremendously high over the last few years. Kalamaja – literally meaning “Fish House” in Estonian – served throughout most of Tallinn’s history as the town’s main fishing harbour, and was home to fishermen, sailors, dock workers and shipbuilders. Everything changed in 1870 when Tallinn was connected to St. Petersburg by railroad. Suddenly enormous factories started to grow in this part of town, bringing with them an influx of thousands of new workers. There are, in fact, still quite a few industrial complexes and sea-oriented businesses operating in the area due to the proximity of the harbours and rail-lines that border the district. Located northeast between the scenic coast and Tallinn Old Town, the fairly tourist-free area of Kalamaja is just a 30 minute walk away from the city centre. If you do not feel like walking you can also take trams 1 or 2 heading towards Kopli and get off at Balti Jaam or Telliskivi. 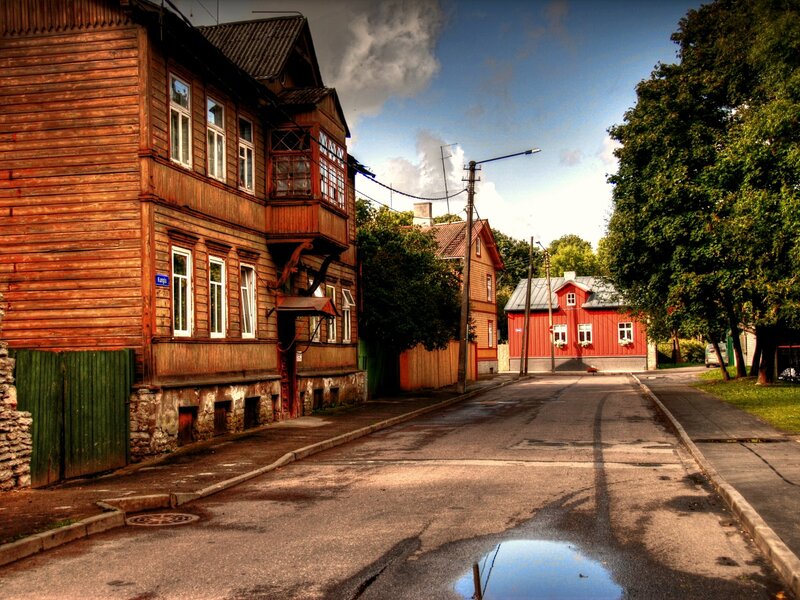 The old and simple wooden houses originally built to accommodate working class have now become Kalamaja’s architectural legacy and give the neighbourhood its unforgettable charm. The most architecturally unique of these houses are called ‘Tallinn Houses’. Built in the 1920s and 1930s, these two-to-three-storey residential houses are made of two symmetrical wooden wings separated by a central stone staircase. Today there are about 500 of these houses in the city. The most beautiful and colourful houses can be found along Salme Street. Just walking around in Kalamaja soaking up the history and charm is an experience itself. Besides being home to some architectural and often neglected delights, Kalamaja accommodates some very interesting sights such as the fascinating Patarei Prison and Sea Fortress, Kalamaja Cemetery Park and the Estonian Maritime Museum of Sea Plane Harbour, just to name a few. Many of these places of interest are found along the Culture Kilometre that runs along the coast between Kalamaja and the passenger harbour. You can even try to shop like a Soviet in the old times at Balti Jaam Market, where you can find anything and everything you can possibly imagine. Another good way to experience the bohemian phenomenon of Kalamaja is to visit Telliskivi Creative City (Telliskivi Loomelinnak), just around the corner from Balti Jaam Market. It is the heart and soul of Kalamaja, a revamped complex of 11 old industrial buildings that has become a magnet for all kinds of creative initiatives and activities. Telliskivi Creative City is a popular hangout, with off-beat restaurants, pubs, art expos, trendy boutiques, antique shops, alternative theatre, clubs and so much more. This is a must-visit place in Kalamaja!